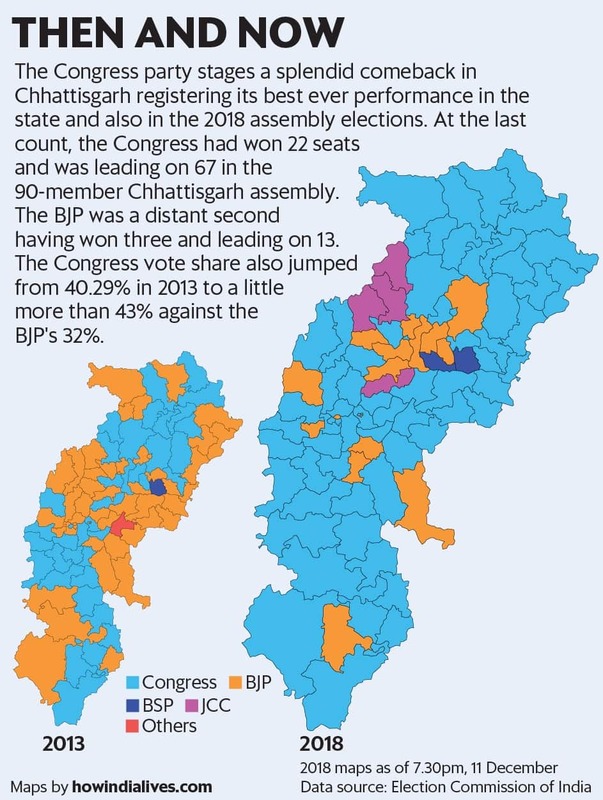 The Congress comeback in Chhattisgarh has an ironical but important aside for the vanquished Bharatiya Janata Party (BJP). It lost comprehensively an election which it was broadly tipped to win on the basis of the performance and popularity of chief minister Raman Singh. The Congress won despite not having declared a chief ministerial candidate, while the BJP suffered its worst loss in Chhattisgarh even though it had a widely accepted and popular chief minister. So much so that the BJP built an entire campaign around the image of Raman Singh with party icon Atal Bihari Vajapyee in the backdrop for his special relationship with Chhattisgarh, a state the Vajpayee-led NDA government created in 2000. “Now since we have won a big victory, it can be accepted that we did not have a chief ministerial candidate who was as popular as Raman Singh. Unlike most BJP leaders, including Modi, Raman Singh is a politician with very few angularities which helped him build a non-controversial image," conceded a Chhattisgarh Congress functionary who did not want to be named. The BJP also built the brand Raman Singh, 66, as the credible leader who had delivered for three generations of people in Chhattisgarh—the first generation when the state was in its infancy, the middle generation which got the benefits of governance, and the young generation with aspirations of growth. “We ran an advertisement campaign on this theme and got a positive feedback from voters," says a BJP functionary in the campaign team of Chhattisgarh. Raman Singh, popularly known as ‘chawal wale baba’ for his public distribution scheme under which the poor would be given rice for ₹ 1 and ₹ 2kg, led from the front, addressing himself in the first person as “Dr. Raman" and crisscrossing this geographically difficult state in a whirlwind campaign. Yet, Raman Singh, who at the last count was leading from Rajnandgaon by over 15,000 votes, presided over a BJP loss that his image and popularity could not prevent. The outgoing chief minister was as upfront and graceful in defeat. He told news agency ANI that he took full responsibility for the defeat as the election was contested under his leadership. Raipur-based political commentator and former IAS officer Sushil Trivedi said the irony in the BJP losing in a big way despite being led by a popular chief minister could be explained by the scale of anti-incumbency against some of Raman Singh’s ministerial colleagues and bureaucrats. “Raman Singh is the most popular leader in Chhattisgarh by some distance and even Congress leaders accept that in private. He has also done lot of work for the state. Yet, even he could not stand between the severe wave of anti-incumbency against the behaviour of some of his colleagues and the administration. He bore the brunt of that anger which was not personally directed at him."